Online master's degrees in school counseling provide the tools and skills counselors use to guide children through their growing-up years. An online school counseling master's degree prepares students to work effectively by applying assessment and intervention principles to the needs of children and adolescents during their school years. This guide provides a comprehensive look at the skills and knowledge students gain in an online master's degree in school counseling, the requirements for graduation and the careers available to program graduates. 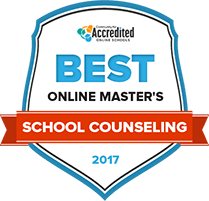 Continue reading to learn about the best online master's degrees in school counseling. What Can You Do After Earning Your Degree? Attending graduate school is an important time and financial investment, and choosing the right school and program can maximize that investment. The rankings below provide an insider look at what makes the following school counseling master’s degrees the best in the nation. The schools listed below top the list due to affordable tuition, amount of financial aid awarded to students, student-faculty ratio and academic services. The Counselor Education Program at North Carolina Central University prepares professionals to work as counselors at K-12 schools. The School Counseling Education MA Degree is a 51-hour graduate program including a practicum, internship and approved research. Coursework focuses in counseling ethics, theories and techniques, cultural diversity, group counseling, statistics, assessments, interventions and consultations. Prior to undertaking the practicum, students must complete a hands-on pre-practicum. Participating districts include Durham Public Schools, Wake County, and Chapel Hill/Carrboro City. Prior to graduation, students must present and defend an academic portfolio and sit for the Counseling Preparation Comprehensive Examination (CPCE). Degree requirements in the Master's in School and Clinical Mental Health Counseling at Canisius College include completing 48 to 60 credits of academic training. Clinical Mental Health Counseling majors also complete a 3,000 hour externship. Students also have the opportunity to engage in independent study, earning one to three credits by attending related conferences, conducting research or completing specific readings. The training is approved by the Council for Accreditation and Related Educational Programs (CACREP). Education on topics such as child abuse prevention, research, counseling theory, group counseling and family and couples counseling prepares graduates to offer psychological support to struggling students and their families. The master of science program at Arkansas State University-Main Campus focuses attention on school counseling. Students will learn how to coordinate programs and support educators in sustaining student health. The program is designed for K-12 counselors who directly interact with young students in the school environment. The program is accredited by the Counsel for Accreditation of Counseling and Related Educational Programs, as well as the National Council of Accreditation for Teacher Education. The program covers coursework and training that prepares school counselors with the same expertise as counselors in several other settings. The University of Central Arkansas Leadership Studies department offers graduate students a school counseling master of science degree program. Students are required not only to complete all the coursework, but to satisfy practicum and internship field experience requirements. Students can pursue the program on campus or online. For distance learners, most coursework is delivered in a synchronous format, although some classes are asynchronous. Online learners will be required to attend some face-to-face meetings and sessions. Whether online or on campus, graduates will leave the program prepared to design and implement developmental counseling programs in schools. Arkansas Tech University’s Center for Leadership and Learning offers the Master of Education School Counseling and Leadership degree program to develop professionals and prepare them for Arkansas licensure as a school counselor leader. The academic program is made up of 17 hours in school leadership studies and 28 hours of coursework in school counseling theory and practice. School experiences are built into the practical curriculum. The program is designed to be completed in three years. Graduates of the master’s program at ATU can take examinations to earn licensure credentials in School Counseling and Leadership (COUN - Counselor Leader). Flexibility is a key takeaway in the Seton Hall University Master of Arts in School Counseling program. The bulk of the flexibility is due to the fact that the program is delivered online. Graduates of this program can counsel students who attend elementary school, middle school or high school. In addition to working with students, counselors may work with a student's parents. The New Jersey Department of Education approves Seton Hall's school counseling program. Areas that the 48 credit degree program delve into include clinical, crisis intervention, prevention and educational difficulties. An internship is part of the program. Northwestern State University of Louisiana is home to a 60-hour graduate program leading to a Masters of Arts in Counseling. The degree program combines online studies with face-to-face class sessions on campus at Natchitoches. Graduate students can choose career options in School Counseling or Clinical Mental Health Counseling. The school counselor concentration conforms to educational standards created by the American School Counseling Association (ASCA). Graduates are academically qualified for current State of Louisiana testing for the Licensed Professional Counselor (LPC) designation. The program also satisfies educational requirements for earning the National Certified Counselor (NCC) credential. Graduate students are required to complete directed field experiences in educational settings. Current or aspiring school counselors can pursue a master of arts degree in school counseling from Indiana Wesleyan University. The program teaches students to approach counseling theories with solutions grounded in the Christian faith. Students will deal with weighty subject matter that they are likely to encounter in the field, including substance abuse, pregnancy, physical abuse, sexual activity, suicide, neglect, bullying, divorce, eating disorders and issues in the home. The program is accredited by the Council for Accreditation of Counseling and Related Educational Programs and the Council of the Accreditation of Educational Preparations. Indiana State University’s School Counseling M.Ed. degree program prepares graduates to test for the Indiana Kindergarten-12 School Counselor Standard License. The graduate program includes a thesis/non-thesis option. The curriculum begins with studies in research foundations and advances into major areas in child counseling, career development, group work and program administration. Additional, advanced scholarship is required in school social and development courses. Finally, students must undertake a professional on-site practicum during the last semester of the program. Students pursuing a master’s thesis must also complete additional hours up to six credits. The master of education in guidance and counseling degree program at Angelo State University prepares students for careers as counselors in colleges, universities and public schools. Upon graduation, students will be qualified to apply for the State Board for Educator Certification, which is required for anyone who wants to serve as a counselor in Texas schools. Applicants must also hold a Texas Teacher Certificate. Out-of-state students can earn the degree, but it's their responsibility to meet their home state's certification requirements. In addition to their coursework, students must also complete a comprehensive program review. Using the tool below, prospective students can search and compare online master's degrees in school counseling based on school type, tuition rate, student population and acceptance rate. Narrow down your program options by using the interactive tools that tailor the results to your preferences. School counseling is a demanding profession and departments expect a lot from graduate students. This section outlines the average timeline for online school counseling degree programs and includes general requirements students must meet for admission and graduation. Although the admissions process varies from school to school, the following are examples of the requirements that online graduate schools may have for applicants applying to the school counselor program. Applicants must demonstrate relevant work history in the field of education or a related school setting. For example, licensed teachers may need at least two years of teaching experience at a school, while those without a license should have relevant experience in an educational setting, such as in a school administrative position. In order to certify an applicant’s abilities professionally and educationally, most online graduate schools require that prospective students submit letters of recommendation. These references can come from professors or employers, ideally in the education or counselor fields. Applicants to a master's degree program in school counseling must submit their GRE scores. If their scores are older than five years, they will need to retake the test and submit their new score. International students may be required to take the TOEFL examination if their first language is not English. Many graduate schools require the inclusion of a personal essay along with the master's program application. The personal essay is designed to summarize an applicant’s education and work history, while explaining why an online master's degree in school counseling will help them with their future goals. Applicants may also be asked to write about a specific topic, such as the challenges that school counselors face and how they should be addressed. Preference may be given to those who studied school counseling during their undergraduate years. However, many schools also accept bachelor's degrees in child psychology or general education. There are a number of specializations within the school counseling discipline designed to help students with a variety of backgrounds. Many school counselors choose to specialize in areas such as addiction, crisis and trauma, elementary school, secondary school or mental health. Research skills are vital for working in as a school counselor. Students must learn how to conduct research using qualitative and quantitative methods and publish their findings in a professional setting. Assessments help school counselors identify the needs of specific students. Counselors must have a comprehensive understanding of psychometric principles, practices and theories. During their master's program, most school counselors learn about different types of assessment tools based on clinical, psycho educational and vocational measurements. Successful school counselors must be able to work with students from different races, socioeconomic backgrounds, and cultures. Year-two students are armed with the tools necessary to help students from all backgrounds and demographics. School counselors may work with a group of students experiencing similar issues. During an online master's program, school counselors learn how to work with students in a group setting, and how the psychological dynamics of each student affects the group. A large portion of year-two studies as a school counselor master's student is devoted to preparing for the school counselor licensing examination. While most states offer their own requirements and licensing for school counselors, national accreditation is also available and will allow graduate students to become a National Certified School Counselor (NCSC). Before graduation, online school counselor graduate students must prove their mastery of the material and demonstrate the ability to apply their knowledge in real-world situations. These are examples of general graduation requirements that students can expect to encounter in an online school counselor master's degree program. Students choose a thesis topic in the field of education, school counseling or children's psychology. Students must conduct research, implement their findings in an educational setting, write a paper detailing their findings and defend their work in front of a panel of professors in the education department. Prospective school counselors must obtain hands-on experience through a practicum or internship program before graduation. This is particularly important for online students. Most school counselor online master's degrees require at least one semester of hands-on training and work as a school counselor. Students are required to demonstrate their competence in education, child development and counseling by passing a comprehensive examination. These exams are usually taken online, although some online schools require students attend a satellite campus to take examinations. Some online schools may require school counselor students to participating in a data project or research project. This may involve analyzing information of a hypothetical student and creating an assessment of that student’s needs and creating plan for intervention. Some students are expected to complete the Praxis examination in school counseling, which is a standardized test that measures knowledge of theories and their practical applications in the workplace. Other states may require students take the state license exam for school counselors or take the National Certified School Counselor (NCSC) exam. What Can You Do After Earning Your Online Master's in School Counseling? An online master's degree in school counseling opens the door to a number of career paths in nonprofit organizations, schools or educational corporations. The U.S. Bureau of Labor Statistics predicts a healthy increase in job opportunities between 2014 and 2024. The Bureau of Labor Statistics predicts that increased public awareness of mental health and how it ties into education will boost interest and need in the school counselor field. The following is a sampling of the jobs available to school counseling professionals, the average salaries these positions command and their projected job growth. From coping with bullies to making decisions about career paths, counselors help students handle the events in their lives. School counselors assess students and give them advice on issues such as academic performance, social interactions and college choices. Career counselors help students make decisions about their future professions based on abilities and interests. School psychologists use their expertise to assess learning, behavioral and emotional problems that students have, and use that information to create action plans. They work in concert with student's families, teachers and administrators to develop strategies that will help students both in the classroom and at home. Note: Becoming a school psychologist usually requires additional study through an Education Specialist degree, but it is one path open to school counselors. Substance abuse and behavioral disorder counselors work with patients who have addictions to drugs, alcohol, tobacco and gambling. Students with conditions such as bulimia and anorexia are also guided by these counselors. These professionals assess patient's problems and make recommendations on corrective actions they can take. The counseling profession is governed by a number of legal and ethical standards. During their studies, students learn the state and federal laws guiding interactions with students and their families, licensing regulations, mandated reporting and recordkeeping. Counselors must understand differences in race, ethnicity and culture so they can provide the right services and tools to meet the needs of all students. School counselors are often tasked with the responsibility of providing interventions for student crises. The principles of crisis intervention in school settings help school counselors address every problem and crisis. School counselors must have a deep understanding of the theoretical and practical aspects of career counseling. School counselors learn to administer career assessments and consider multicultural issues when talking to young people about work options when studying for an online school counselor master's degree. School counselors can take advantage of these professional associations that provide ongoing education and training in an ever-changing field. The following resources provide additional information for school counselors with a master's degree in school counseling. The American Academy of Child and Adolescent Psychiatry offers education, advocacy services and research to help school psychiatrists and counselors who treat young children, adolescents and their families. The APA offers publications, advocacy, news and a psychology help center designed to help school counselors. Members can join one of the association's 54 divisions, including sections devoted to educational, counseling, school, rehabilitation, developmental and clinical psychology. The ASCA offers professional development resources to school counselors with its publications, Professional School Counseling and School Counselor. The association provides access to the latest research, advocacy support and continuing education courses.||$$||The International School Psychology Association provides services to school psychologists. The society is a one-stop resource for school counselors on topics including child development, mental health, crisis intervention, emotional intelligence, children's rights, and violence prevention. This association represents school psychologists from around the world and graduate students preparing to enter the field. The group organizes an annual convention, provides a career center and publishes books and periodicals.